This year I committed to reading 18 books, and I’m well ahead of schedule at the end of January – I’ve read 3 books and about 870 pages this month. So I don’t forget what I’ve read as we move through the year, I’m going to wrap up each month with a recap of what I’ve read. Here’s January’s. 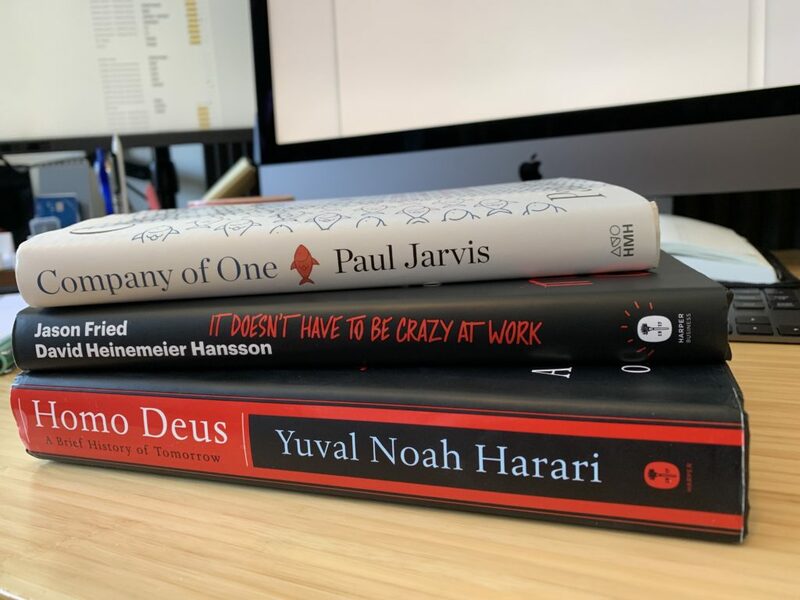 I absolutely loved Yuval Noah Harrari’s first book, Sapiens, and was excited to see what Homo Deus had to offer. This book was decisively heavier. It takes a look at what humans will try to do now that we’ve basically solved the problems of famine, plague, and war. While they aren’t eradicated completely, Harrari points out they aren’t the inevitability they were even 100 years ago. So we will basically turn to immortality and eternal happiness, here on earth. In general I really liked it. But he has 2 competing ideas: everything we do is an algorithm and therefore predetermined. This means there is no soul, free will, or conscious self. And we know nearly nothing about how our brain works. I find it hard to reconcile these as it’s hard to rule out anything when we know so little about the brain. That said, he makes some good arguments. While I often question my own beliefs (as one should do), this got me questioning them more than usual. I think it’s an incredibly interesting book – just make sure you set aside good time to read and think about it. My next book was decidedly less heavy, and much easier to read. It Doesn’t Have to be Crazy at Work reinforced a lot of what I already believed, while filling in some important gaps. 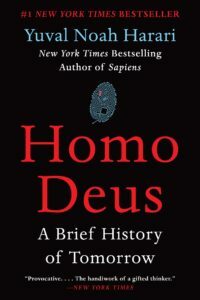 Each section is well written and easily digestible, making it a great book to fill in gaps in your day (and it was a great pallet cleanser from Homo Deus). I love what they said about distractions, and even took action to reduce the distractions in my life by limiting the hold Slack has on me. I also love what they say about project timelines and goals, which are basically, “6 weeks at a time, and we have no long term goals.” It sounds counterintuitive, but this is actually how I work. While I can set long term goals for myself, I’m not an oracle. So more often than not I scrap any “blue sky” goals and get stressed about it. I like the idea of switching to this workflow. Super easy read. lots of consumable information. They talk about the practices that seemed only like a pipe dream. 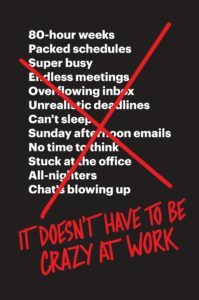 Every manager should read this book. I like that I happened to stack Company of One right after It Doesn’t Have to be Crazy at Work. Both of these books reinforce the benefits of staying small, and what we should focus on as a result. 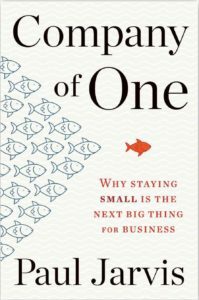 This book follows the much more traditional format of “point, 4 stories to reinforce point, repeat point.” It’s a classic business book in that sense, which made it pretty easy to read because I could skim a lot of it. My main complaint about the book is that sometimes it feels like he manufactures “traditional business” situations just to drive his own point home. Everything is well cited except for times where it seems his own perception is stated as fact. He uses examples of people who are very much not a company of one to drive some of his points, like Ev Williams, who constantly takes on VC funding (a big no-no) and doesn’t actually care about his customers (crucial for a company of one). All-in-all I liked a lot of what he said though. I really took what he said about connections with customers to heart, as well as the importance of educating first. I know reading this will be helpful for my business and have lots of notes on how I will implement his advice. I’m really happy with my reading goals (and accomplishments) for this year so far. Reading every morning has been a great way to start my day and is proving to be very beneficial. This morning I started reading Educated, and the first 2 chapters have me hooked. Excited to get through it! Are you reading anything you like right now? Let me know in the comments!